You guys, this will be a long post. Get some snacks... ready? We are definitely not done decorating our place but I finally got the time to shoot some of the things I'm loving and adoring lately. Esta será una publicación larga. Consigan algunos snacks ... ¿listos? Definitivamente no hemos terminado de decorar nuestro espacio, pero finalmente tuve tiempo de fotografiar algunas de las cosas que estoy amando y adorando últimamente. As many of you know, we moved from DR and it was a challenge to get rid of stuff and manage to keep the ''necessary'' which is always a whole LOT more than we expect. This time around I'm meticulously selecting pieces for the space and oh, I'm having so much fun. I'll be talking in detail about pretty much everything you see in the pictures. Como muchos de ustedes saben, nos mudamos de RD y fue todo un desafío deshacernos de las cosas y lograr mantener lo "necesario", que siempre es mucho más de lo que esperamos. Esta vez estoy seleccionando meticulosamente piezas para el apartamento y creanme, me estoy divirtiendo un mundo. Estaré hablando en detalle sobre casi todo lo que ven en las fotos. Having the rug was quite an adventure. I wanted something VERY specific, I wanted something Moroccan and with tassels. Even though I was looking for a small rug (5x7 or 5x8) guys... they were incredibly expensive, I was taken aback by it honestly. After searching the whole wide web I found the PERFECT one. I got the 5x7 Jessie Moroccan Lattice Tassel Rug from Nuloom it's absolutely gorgeous and very affordable, the quality is amazing, I'm obsessed with it. 5x7 de Nuloom , es absolutamente preciosa y muy asequible, la calidad es increíble, estoy obsesionada con esta pieza. I have a thing for pillows, but I didn't want to overwhelmed the couch with an unnecessary amount of cushions, I wanted to keep the simplicity and the minimal vibes it already had. I saw these Chunky Knitted Pillows from WoolandMoon and fell in love with them, there's something about knitted pieces that I completely adore, it's so unique and homy. Tengo algo con los cojines, los amo, pero no quería abrumar el sofá con una cantidad innecesaria de ellos, quería mantener la simplicidad y el estilo minimalista que ya tenía. Vi estos Chunky Knitted Pillows de WoolandMoon y me enamoré de ellas, hay algo en las prendas tejidas que adoro por completo, es tan único y acogedor. What I love about Etsy is that I get the chance to discover stores like this one. Marina (The Seller) is a daytime architect in Manhattan and a night time maker in Brooklyn. The pillows are handmade by her, she uses vegan and washable yarn. These pillows are amazing, incredibly comfortable and so, so soft, Pugie loves them, you need to check out her store asap. Lo que me encanta de Etsy es que tengo la oportunidad de descubrir tiendas como esta. Marina (La Vendedora) es una arquitecta durante el día en Manhattan y una fabricante de noche en Brooklyn. Los cojines son hechos a mano por ella, usa hilo vegano y lavable. Estos cojines son increíbles, súper cómodos y sumamente suaves, Pugie los ama, debes visitar su tienda lo antes posible. This is what I mean when I talk about ''unique pieces'' these Knot Pillows from SilverSeaCrafts are so cool I had to have them. They are so fun, so different and such a statement, is impossible not to notice them and not feel the need to touch them. They have 12 colors available for you to choose from, I picked these because I love muted shades and I honestly think they go perfectly well with the atmosphere here. de SilverSeaCrafts son tan chulos que tuve que tenerlos. Son tan divertidos, tan diferentes, es imposible que pasen desapercibidos y no sentir la necesidad de tocarlos. Tienen 12 colores disponibles para que elijas. Escogí estos porque me encantan los tonos apagados y sinceramente, creo que van muy bien con el ambiente que hemos creado. Even though this is not the final coffee table decor I wanted to show you guys how gorgeous this combination looks so far. I knew I wanted gold pieces to decor the table but I wanted it to be simple yet classy so when I saw this Geometric Brass Sphere ornament from HimmeliArtDesign it was love at first sight. I got a set of three (the rest are all around the house, you'll see where soon), they are also handmade, the look of the brass is beautiful and they make a great contrast with these black and white Fashion Books from TheLuxeLibrary they are custom-made as well and look amazing, she's really good. también están hechos a medida y se ven increíbles, ella es muy buena. Since we have to think smart when it comes to sitting space, I decided on getting a pouf instead of a proper furniture, because first it's gorgeous, second it takes no room and third you can use it as an ottoman as well. This Moroccan Leather Pouf from MaisonMarrakech is perfection, I absolutely adore the color, the quality is amazing and as the rest of the pieces it's what we were looking for. de MaisonMarrakech es la perfección, adoro el color, la calidad es increíble y al igual que el resto de las piezas es justo lo que estábamos buscando. This 21"x14" Neon Sign from JESSIEPIARD is the cherry on top. I love this, I love the contrast, the retro look and the boldness it adds to the space. Love the fact that the light is pink, which is the only pop of color you'll see in the apartment. It's such a cool piece and it's so well made. The store has a whole lot of options and colors to choose from, but ''Treat Yourself'' was the one that was more ''myself''. es ''The cherry on top''. Me encanta, me encanta el contraste, el aspecto retro y lo atrevido que agrega al espacio. Me encanta el hecho de que la luz es rosa, es el único toque de color que verán en el apartamento. Es una pieza tan original y está muy bien hecha. La tienda tiene un montón de opciones y colores para elegir, pero entiendo que '' Treat Yourself '' fue va mejor conmigo. We're still adding details to everything and there's a lot I want to keep doing but I wanted to show you the process of everything. I really hope you like this new ''section'' where I share with you my Home Decor adventures, I hope you can find some #Inspo for your own place and maybe some ideas as well?. Todavía estamos agregando detalles a todo y hay muchas cosas que quiero seguir haciendo, pero quería mostrarles el proceso de todo. 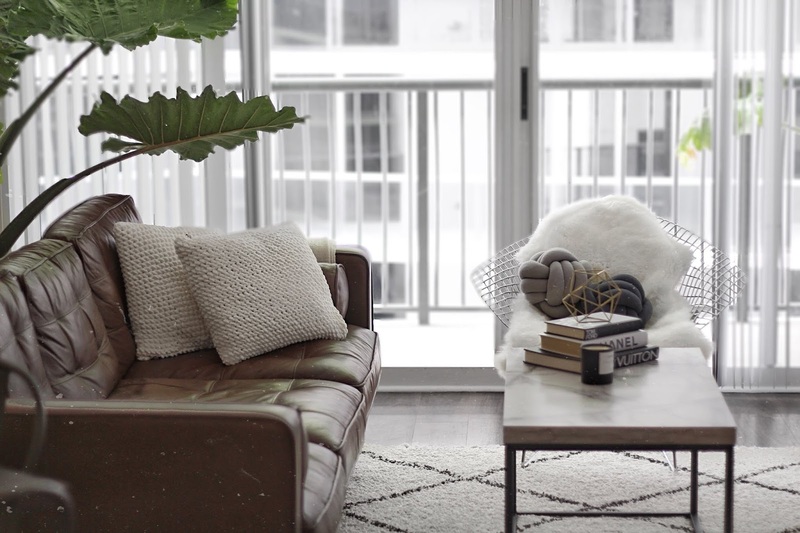 Realmente espero que les guste esta nueva '' sección '' donde comparto con ustedes mis aventuras de Home Decor, espero que puedan encontrar algún #Inspo para sus propios espacios y tal vez también algunas ideas. Let me know what you think about the pieces in the comments below and remember you can also follow me on Instagram @mandypaulino for daily doses of my life. Déjenme saber lo que piensan sobre las piezas en los comentarios y recuerden que también pueden seguirme en Instagram @mandypaulino para una dosis diaria de mi vida. It is such a gorgeous space! Sometimes, it is really tough to figure out what needs to stay, what can go, and what gives a room that perfect finish. You've done an amazing job! Thank you so much, Shannon. Means a lot!! Wow, what amazing decor and really well thought out style! Thank you so much, Rosanna. Happy to know you like it!! Mandy!!! Estoy amando cada esquina de tu casa. Todo es tan tu!!!! Me alegro por ustedes y les deseos mucha suerte y prosperidad en su nuevo hogar. Laulita!! Que hermosa <3 Mil gracias. I know that comes from the heart!! Un abrazote! !